Dragon fuit is a fruit that grows on several species of cactus that are native to Mexico, Central, and South America. The edible, mushy, pulp of the dragon fruit, which makes up 60 to 70% of the total fruit, is said by many people like kiwi, a characterization that is common to most descriptions. Some people say that the taste is melon-like, and reminds them of a cross between a kiwi and a watermelon. Others include pear in this description. Sometimes, the taste is described simply as tropical. 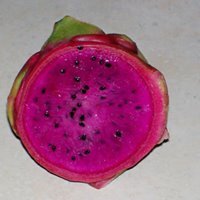 Keep in mind that each person may experience the flavor of dragon fruit a bit differently, and texture has a lot to do with this perception.